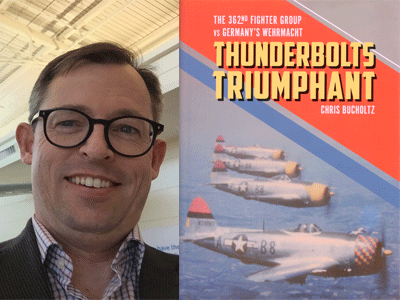 Author and aviation expert Chris Bucholtz discusses his fascinating work, Thunderbolts Triumphant: The 362nd Fighter Group Vs Germany's Wehrmacht. A highly-illustrated history of the 362nd Fighter Group, tracing their air-to-ground missions over Europe in 1944 and 1945. During World War II the Ninth Air Force comprised air-to-ground aviators, charged with destroying the enemy close to the front and below the clouds, often bringing them face to face with their German opponents. The 362nd Fighter Group, led by two very different leaders - the tough disciplinarian Col. Morton Magoffin and later the beloved motivator Col. Joe Laughlin - had one of the best track records in the Ninth Air Force. It destroyed over 5000 trucks, 350 tanks, 275 artillery pieces, 45 barges, and 600 locomotives. But this score came at a cost, as over the course of 15 months of combat in 1944 and 1945 more than 70 pilots were killed in action and in June 1944 alone 30 of their P-47 Thunderbolts were lost. The other groups jokingly referred to them as the "362nd Suicide Outfit." Thunderbolts Triumphant provides a narrative history of the group and gives a glimpse at the fascinating men who flew these missions and maintained the aircraft as they navigated Europe. Starting with the D-Day invasion, the group was the aerial artillery support for U.S. ground forces, first in Normandy, then in reducing the defenses around Brest, then in supporting the U.S. Third Army as it drove across France and Germany. Special emphasis is given to its most spectacular missions such as the breaching of the Dieuze Dam and its incredible performance during the Battle of the Bulge where it demolished much of the Sixth Panzer Armee as it tried to escape eastward.